Lake Livingston is the 2nd largest lake located within the borders of Texas. It is 39 miles long and at it’s widest point it is 7 miles. With 450 miles of shoreline, Lake Livingston is never crowded. It covers 93,000 acres and has been dubbed a “Water Wonderland”. There are many beautiful homes, and campgrounds surrounding the shore’s. Within the Lake Livingston area, there are 4 different counties including, Polk, Walker, San Jacinto, Trinity. Lake Livingston has several small communities located along it’s shores. Making them a perfect place to live or visit. 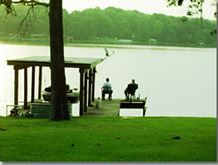 So if its a weekend cabin, or retirement hide way, that you are seeking, come and enjoy Lake Livingston.